There are particular things in the world you know you'll only experience once, and for me, this was Rome. Like a museum of the world, Rome seemed so anciently dreamlike and untouchable; it was another world in itself. I'd seen plenty of history by the time I reached Rome, but the ancient, crumbling structures on each corner didn't fail to blow me away. Am I really here? Is this for real? Like the movie The Titanic, Rome is one of those rare places in the world that - once experienced for the first time - leaves the traveler with a sense of finality and fullness. Rome is like an elusive lover, leaving a mark that lasts forever, but not offering the kind of comfort from a friend that elicits frequent visits, like Paris or London. Perhaps that's where the famous saying, "When in Rome," came from, for when you're in a place like Rome, it's likely you'll never be there again. And since it's most likely your first and your last, there's simply no greater and easier excuse to accept without a fight. Standing before the Colosseum was something else, though. And seeing it for the first time as it stood there ever so triumphantly and demurely (if there ever was a combination of the two) my eyes could hardly believe what they were interpreting. 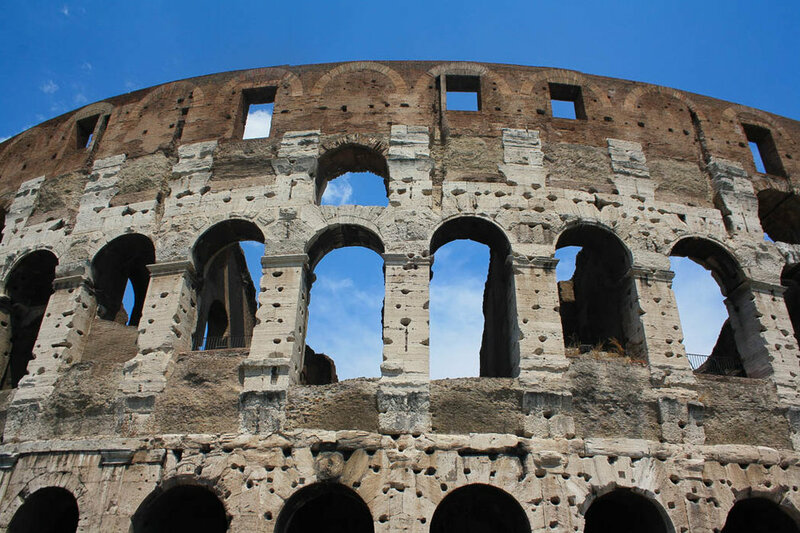 On my way into Rome I knew it would be the most ancient structure I'd yet to lay eyes on, and yet seeing it suddenly standing before me as I exited the metro station, I couldn't have been more surprised. Though I'd be lying if I said I was an avid history buff, I found the stories and the tales that surrounded each of the historic structures fascinating. I imagined what life would have been like, peering inside the front gates of the Colosseum and wondering at the many gallant and gruesome performances it once hosted. A tour of the Vatican and dozens of history lessons later, Rome was quickly coming to a close. We decided we'd bring a little simplicity and modernism into our Rome trip. On our final evening we decided to cozy up at Piazza Navona with a bottle of wine, some cheese and pickles, and a conversation about today and tomorrow - almost completing forgetting about yesterday, the past, and the history. Though you can feel pressured to immerse yourself in the then when surrounded by so much history, sometimes there's nothing better than enjoying the now, and dreaming about the next journey. And there's simply no reason not to enjoy what's before you - right now.